1960, I love you. 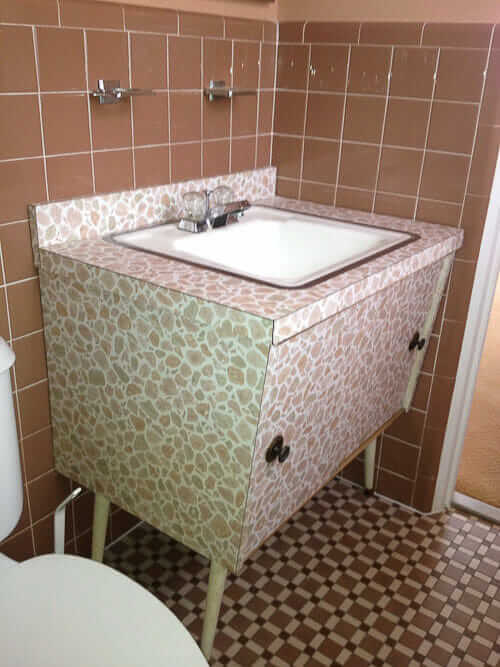 I recently heard from reader Lynn, who has just bought a 1960 brick ranch house that includes some great original features — like this amazing laminate-covered vanity. She call it a “giraffe” or “leopard” pattern. I’ll call it “Wilma Flintstone’s”. Luv. 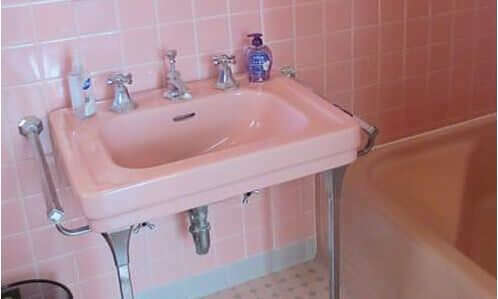 Read on for Lynn’s story and 6 more photos of this rare and delicious time capsule bathroom. My husband and I bought our empty nester downsize home. It is a 1960 all brick ranch. We have not moved to it yet, and would love feedback from readers for decorating and remodeling ideas. 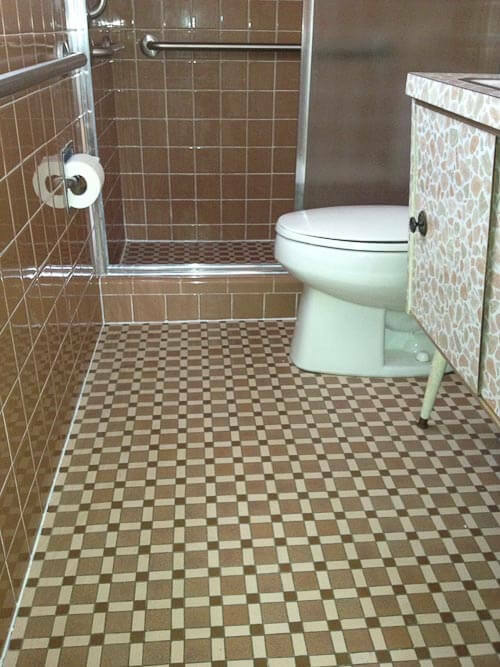 I would like to send photos of the pristine bathrooms: … one a brown with mosaic flooring that I have not seen anywhere on your site yet. 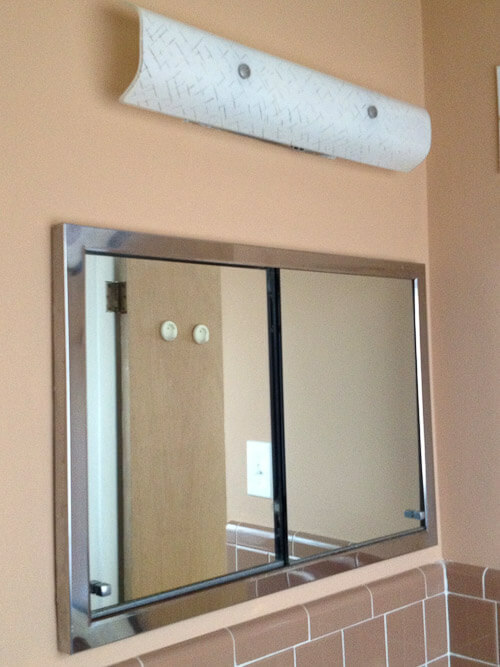 Also, the vanity in the brown bathroom has a leopard or giraffe print on the vanity. 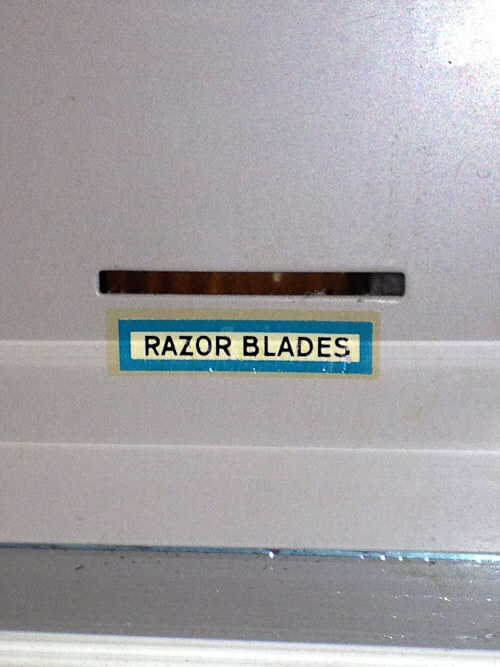 I think it is a Satin Glide style. 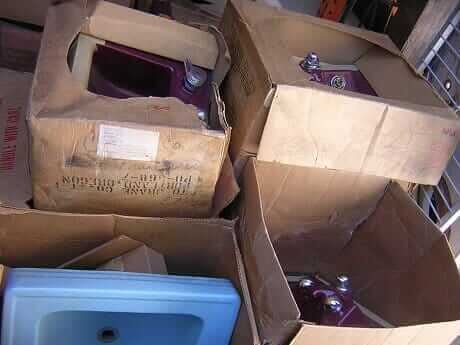 The kitchen was redone in the 70’s or 80’s, but the original pink metal General Electric kitchen was moved to the basement, pink sink and pink cook top intact and functioning. Most of the light fixtures are original. I discovered your website several weeks ago when I started trying to find photos of my very unusual giraffe vanity. I’m learning to love what I have. 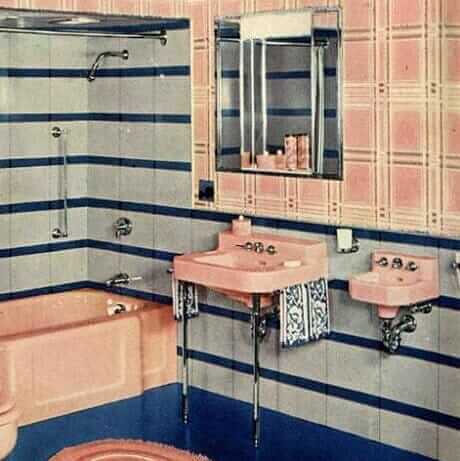 Well, heck to the yeah for that bathroom vanity, Lynn! I love it. Remember: Socrates or Plato or Aristotle or some smart vintage dude like that taught us: “The rare is the good.” You vanity style is not exceedingly rare — but laminate covered like that? YES. And assuming your bathroom wall tile and floor are in good shape — they are quite valuable too, very very expensive to replicate that mud-set tile today — if you can even find someone to do it. The floor looks like it might be porcelain — again, very very expensive to buy and install. This bathroom = Easy to love! Many thanks for sharing it with us! 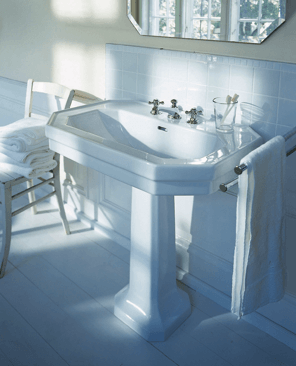 Where to find a vintage bathroom sink with chrome legs and towel bars? See my stories about World of Tile (use Search box) — they are likely to have what you need. 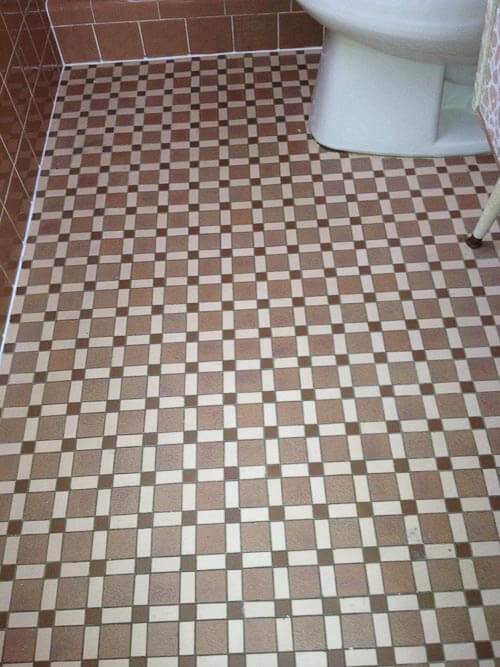 You will need to send an actual sample of your tile for color matching. I would dearly love a vanity like that! Does anyone know if there are any recreations for sale? I’ve tried to find vintage ones used but they don’t seem to exist locally. 🙁 I’m in BC, in Canada. Oh my! That bathroom looks brand new. That vanity makes me SMILE and keeps the room from being monochromatic. love, love, love. That’s a pretty cool bathroom, Lynn. 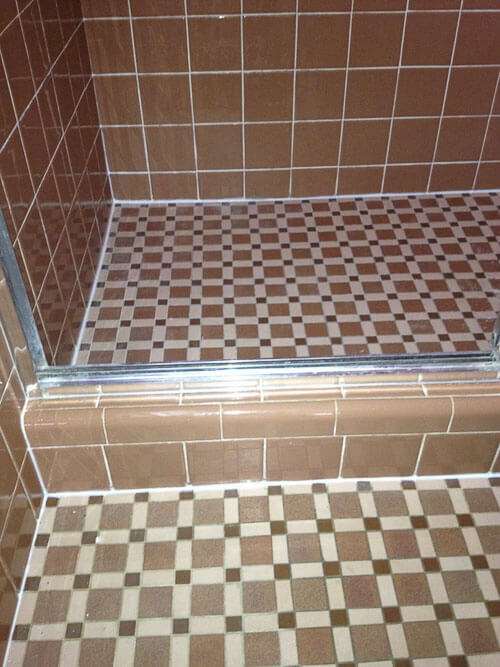 Is that a spacious shower or a shallow bath you have there? Our house was built in `59 and has the same size tile on the wall, the same curved tiles at the top. Our bath used to have a sliding glass door, too, but someone removed it. 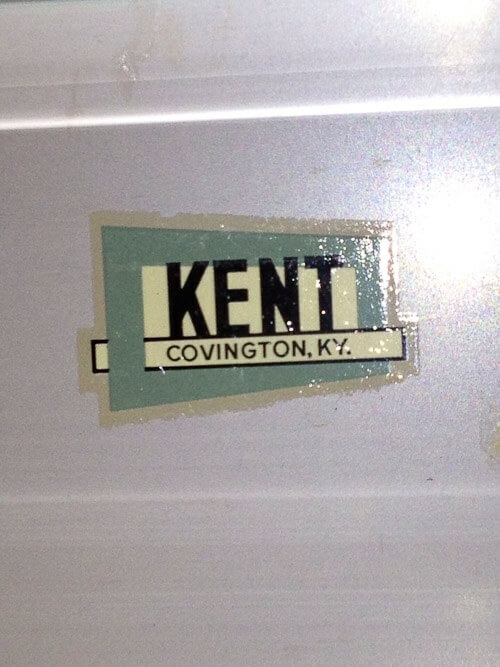 The Kent medicine cabinet was also removed; my father built a custom cabinet to fit the hole as a birthday present. We have a window in our bath: glass brick with a Winco brand aluminum vent in the center. I live in Dogtown and there are dozens of houses that look almost like mine. It’s as if they were all built by the same company based off of three or four floor plans. I’ve been told that this sort of house is sometimes called an “Aboussie House”, after Martie Aboussie, a former alderman. I haven’t found further explanation, but I’d like to know who was the baker who operated the cookie cutter that shaped these homes? Below is the URL to Google’s photo of my house (If the site will permit HTML links, that is. Click the yellow humanoid shape to see the street-level view). If you explore this block, you’ll see that every other house is nearly identical to mine.